Posted January 5, 2014 by Ben & filed under New Bums. Happy 2014. New Bums is alive and well and we hope you are too. We’re gearing up for some action in terms of releases and shows. There will be a full length on Drag City, coming out mid February. Donovan and I have been fooling around with this record for about 5 years now but last year we got serious (I guess). It’s called Voices In A Rented Room. We’re planning a pretty full-on US tour, maybe about 5 weeks, starting early March. We’ve got some friends hitting the road with us as well. We’re also planning a UK/Europe tour for May/June so if you are interested in having us, get in touch in some way. I’ll write more about that when things are finalized but you can always check HERE for the latest news. 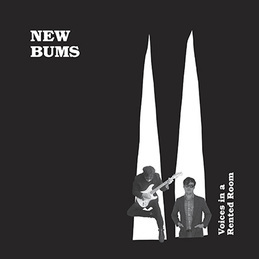 Our 7″ on New Bums Industries is still available via Midheaven. 2013 had us actually taking this jalopy on the road and man, did we have a good time. Bill Callahan was kind enough to let us open up a week’s worth of shows and we’d like to say thank you to all the great people who gave us encouragement. We’d also like to say, contrary to allegations, New Bums were not the ones partying backstage while Mr. Callahan was playing his songs in Chapel Hill. So why did I start a band with Donovan Quinn? Because he’s one of the best lyricist out there today. Living in San Francisco for a few years, down the street from Donovan, was one of the more rewarding times in my life. I learned a lot about writing words. I mean, the man wrote Disciples Of California with his band, Skygreen Leopards. It’s always kind of blown my mind how criminally overlooked Skygreen Leopards are. So it goes I guess. New Bums doesn’t sound like any of that though. We’re more like a straight cross between Donovan’s jams and mine. Donovan has also made some solo records and sent them right into the abyss, though they should be on everyone’s shelf. You could do a lot worse than picking one up. What I’m saying is the guy should be more well known. I’m stoked to be in a band with him. It’s an honor. Oh – and as for Six Organs – I’m working on some crazy insanity right now. It’s very exciting but it’s a lot of work. Essentially I’m building a system and then I am going to use the system for the composition. All I will say right now is that it is inspired by Morton Feldman, Agrippa, Old West Saloons and a bunch of other good stuff. Much more much later!